It's been a short three years since Tesla Motors first opened its doors to consumers in Canada. 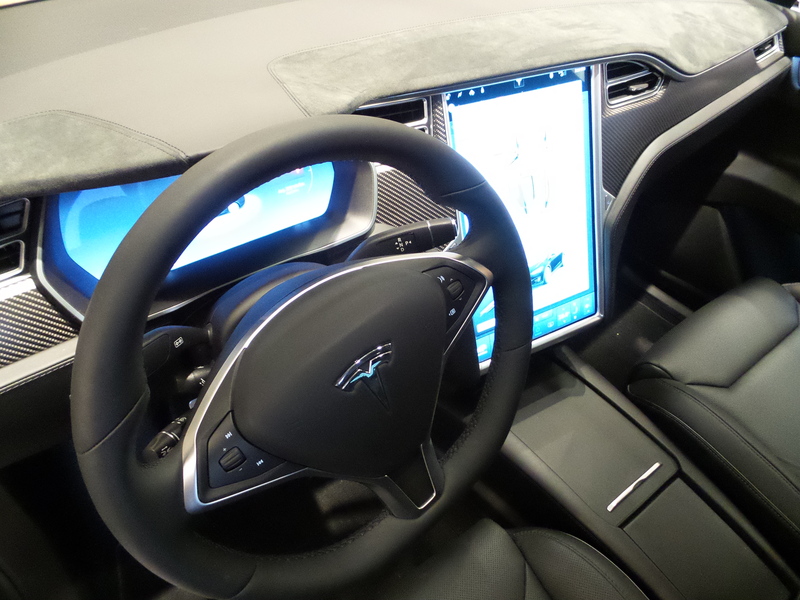 It's also no secret that Tesla, and the chief grandeur that is Elon Musk, have found a successful formula comfortably nestled between luxury, technology, and user experience. While this isn't my first rodeo writing about Musk and his well-accounted endeavours, as a company Tesla has inspired a forward-thinking lifestyle that advocates change in the way people perceive driving. Sure, there are numerous well-received all-electric cars on the market, but there's one primary difference: Tesla's mission statement is centred around the growth of electric vehicles. At the core, what's fascinating is the high volume of Tesla owners that are not only self-promoting their love for the brand via word-of-mouth, but have also enhanced the culture of electrification and the betterment for the environment. The first quarter of 2016 has been an important one for Tesla. Not only has their Model X SUV been in the forefront of nearly every public appearance, but the big launch of their newest vehicle, the Model 3, officially begins at the end of this month. I witnessed the hype at last week's Model X Customer Event at the Tesla showroom -- excitement that both the staff and owners shared delightfully. Tesla-approved owners clubs have been speaking at auto shows and events on behalf of the company. Although owners clubs have been around for decades, its integration into public events is rather unique. When you talk with employees or salespeople, there's generally a "pitch" in the way they speak. When you talk with an owner of a Tesla -- who is at times more excited to talk about it than anyone in the galaxy -- there's more authenticity in first hand experience. The logic applies to virtually anyone that's been told "I have this and love it." It's also unique because the experience-first approach can be more accepting than sell-first. 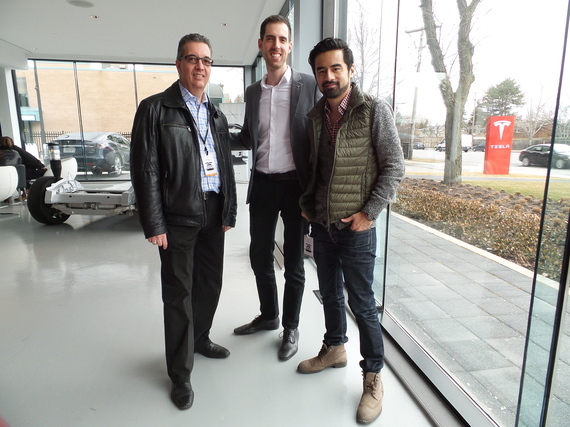 Left: John Dixon, founder of the Tesla Owners Group of Southern Ontario. Centre: Martin Paquet, Store Manager at Tesla on Lawrence. 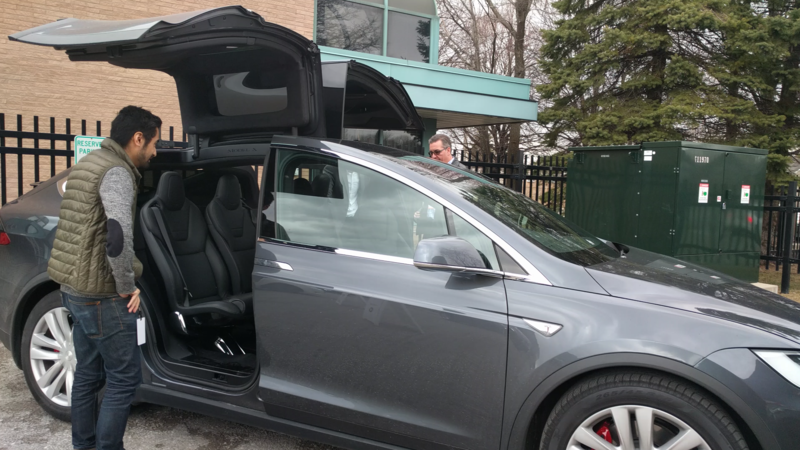 Meet John, Tesla hobbyist, early adopter, and founder of the Tesla Owners Group of Southern Ontario. John is a proud owner of a Model S P85D, and he's credited with pulling together a localized Tesla community with over 200 owners. He and some of his members are typically present at most events and auto shows to verbalize the experience of owning a Tesla. The group includes owners of all types: from blue to white collar, early 30s to late 70s. What pulls this generationally diverse group together? The electrification and charging of vehicles for an environmentally friendly future. Sure, technology is pretty cool to talk about, but what it really boils down to is the electric solution and the retreat from "ICE" cars (internal combustion engine cars), or so they call them. 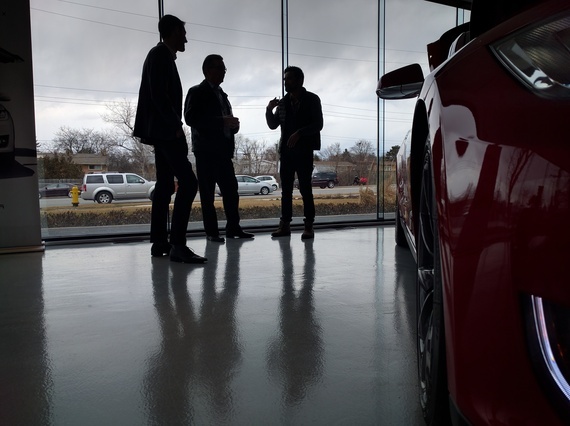 Our conversation with Martin, manager of the Tesla showroom, swayed towards the key selling factors of a Tesla -- the largest being the cash saved from skipping the gas stations. 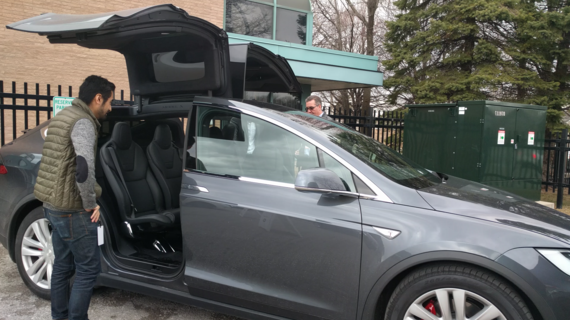 The all-electric Model X goes 400 kilometres before it needs to be plugged in for the evening, which can be done either at home or at many of the charging stations located across the country. In the long run, even if there is an extra monthly cost to upgrade to a Tesla, the justification of driving electric makes it a worthwhile expenditure for cost-efficient buyers. 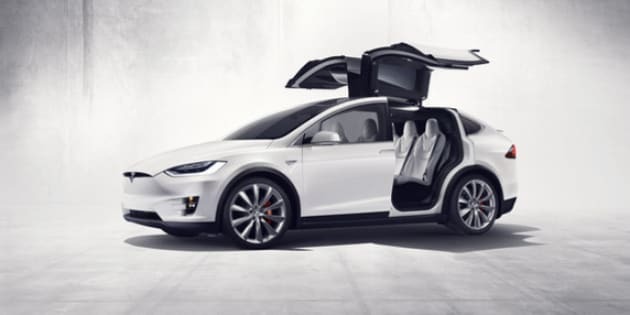 Also, with fewer internal moving parts and less vehicle fluids, the minimal maintenance makes Tesla a popular choice. After a brief chat, we hopped into the Model X for an exceedingly quick highway drive, with John at the helm. If the falcon wing doors are arguably the most significant feature on the exterior, the massive touch-screen on the console is its complement on the interior. Although the Big Sky panoramic windshield does get a (gigantic) nod. This is also the point in which I discovered the "Ludicrous" mode. While the Huffington Post had previously featured funny reaction videos on "Insane" mode, Ludicrous is the next boost up. It's kind of like being teleported into Canada's Wonderland's Behemoth for about three seconds. OK, I might be mildly exaggerating, but that's the feeling I had when we hit 100 km/hour in less than three seconds. Felt like Marty McFly on his first time-traveling ride with Doc. By the end of March, the chatter will shift to the Model 3, their first appearance in the fierce competition over basic luxury (think BMW 3 series, Audi A4, and the Mercedes Benz C-Class). The hype reverberates beyond the troops of Tesla; it extends to a new group of potential vehicle owners who are itching for the experience of luxury technology at a competitive price point. The culture of Tesla has re-inspired progression in a slow moving industry. Buyer excitement sits in the future of automotive: from becoming hooked on electric, to the limitless possibilities of driving technology. They crave the prowess of powerful electric engines, and enjoy the luxuries of community and experience. If there are three beliefs that really charge up a Tesla owner, it's optimism, environmental responsibility, and simplicity. To catch the first public glimpse of the Model 3, the unveiling will be live streamed on March 31st at 8:30 p.m. PST on Tesla.com.